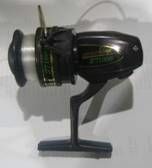 Fishing Supplies - C & R Discount, Inc. Fishing set with FX500 reel and telescoping fishing rod in a camo zipper bag. A telescoping 2.1 meter fishing rod.